With the Swans ever increasing popularity across the globe and in particular the United States, it is always interesting to hear what people think of the club from afar – without the influence of local knowledge and history. As most of you will no doubt be aware, ‘Jack to a King – The Swansea Story’ was given an airing on 30th April in Portland, the largest city in the U.S. state of Oregon and home to the Portland Timbers who play in the MLS. 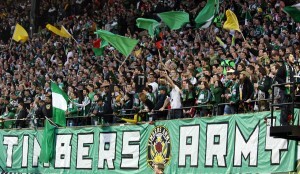 The event was organized by a section of the Timbers Army who do fundraising events for the community. Prior to the film, there was an auction with the main item being a framed Swansea City jersey, signed by the players. With the proceeds of the auction going towards renovations of the cinema and improvements to the sports field at a local high school. Most people present were fans of the Portland Timbers, but they quickly identified with the Swans story, cheering wildly every goal as if they were watching the games in the film live! The Swansea City story greatly enjoyed by the packed cinema and they really enjoyed the interviews with the club officials, players, and the fans. Not to mention the typically understated Welsh humor of course – which brought the house down several times at Cinema 21! The evening ended with a Skype session with Mal Pope, Leigh Dineen, and Lee Trundle, which resulted in some great interaction between the three and the audience. Shawn Levy – who was once a regular movie reviewer for the local newspaper “The Oregonian” was compere for what was a hugely successful evening and has written a review of the Jack to a King which you may like to read. Perhaps even more importantly, there might now be a brand new Swansea City fan club in Portland, Oregon!